You can’t beat the consistent and accurate watering that you get from underground sprinklers. 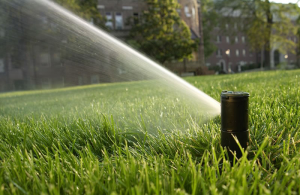 Chinook Landscaping offers professional installation of underground sprinklers systems in Calgary. We will map out your property and identify the number of zones you need for proper head to head coverage. Head to head coverage is very important in order to make sure your lawn is getting even coverage and no one area is getting over or under watered. Planning your garden bed sprinklers so that your shrubs receive the correct amount of water is essential to a properly installed underground sprinklers. Trees and shrubs can die quickly with too much or too little water so setting your bubblers or risers is very important. Your garden plantings and trees have different watering needs and therefore the sprinklers servicing them should never be in the same zones as the lawn. We will place your gardens, trees and lawn, all on separate the zones giving you the ability to water your lawn and trees, or garden beds at different times and for different durations. We will take the time to explain the irrigation equipment to you so you have a thorough understanding of how your underground sprinklers work. Chinook Landscaping prides itself on excellent customer service and we use only the finest irrigation equipment available. You can count on us to provide same day service should you have an issue with your sprinkler system, we fully back our installations with a service warranty second to none. We believe in completing your landscaping job properly first. So when it comes to deposits, we don’t take them for your underground sprinkler system or for any other landscaping component. When we have completed the job and you are 100 % happy with the outcome, only then will we accept payment.